Laura, they are just beautiful. 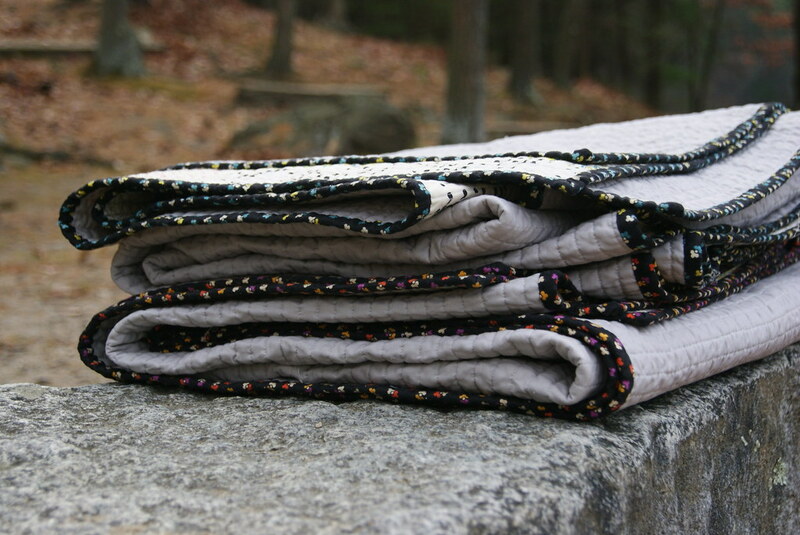 20 hours of quilting…….aaahhhhh!! But so worth it I am sure. You did a marvelous job with the photo shoot. You did find a way to show them off, your friends will be so happy with them…..why wouldn’t they. No need to worry if they are too small…..you can always make more!! Just kidding….they will be perfect. Hopefully the guests won’t sneak them in their bags and take them home on your friends……better want them!! Congratulations! You made it past all the “what-ifs”. The hardest part of all those questions is answering with a sassy, “SO?? What if? ?” Almost always, no bad thing has happened. Even if we’re unhappy with the result, we learned important things and grew as creators. But these are terrific, and I hope you’re proud. Both of the designs and with believing … juuuuust enough … to follow through. Great job! I just teared up seeing these! These are wild and wonderful, and they mix up the colors I love with the colors my in-laws love. Nancy, they BETTER not steal these quilts 🙂 – my mother in law is a big fan of quilts (though she doesn’t quilt herself), and his parents have been really helpful in starting my husband and me out in our new home. It was meant to be a “thank you” for them to have custom quilts when they come to stay. 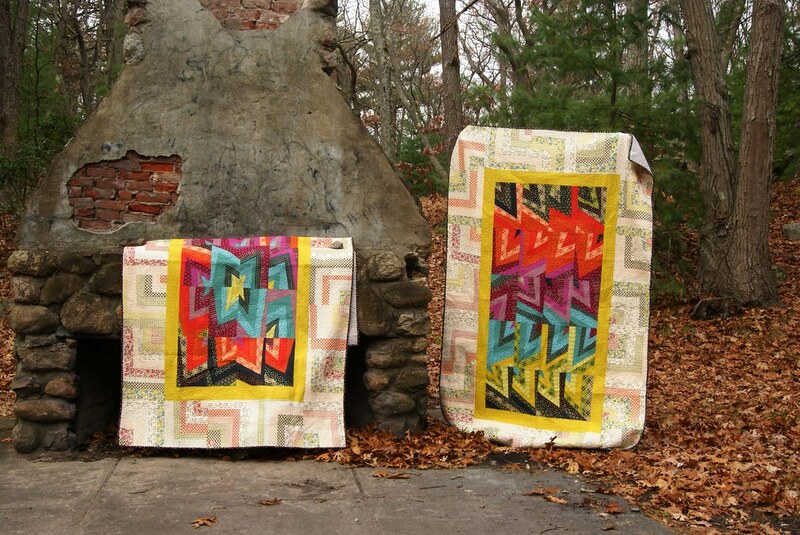 But now my husband is making it clear these are HIS quilts, not theirs …. ! Laura has always been a color inspiration for me. To this day, I put outfits together thinking, WWLD? (What would Laura do?) Always add more color. Dare to put things together. Make other people happy with the colors you put out in the world. And that’s exactly what she does with her quilting and sewing. You are really amazing, Laura. We have two of Laura’s quilts already, plus a pillow, and her efforts make my house so homey. I hope all of you quilters know how happy you make your friends and family. Fabulous creations! Congratulations on trusting yourself. They turned out absolutely stunning Laura! You should be so proud, and i definitely wouldn’t worry about them not liking them. They would be crazy not to!! I’ve loved watching them come together, but seeing them finished… perfection! Oh, And you have EVERY right to be proud! I am sew pleased for you! Glad you pushed on and ignored those self doubting voices! 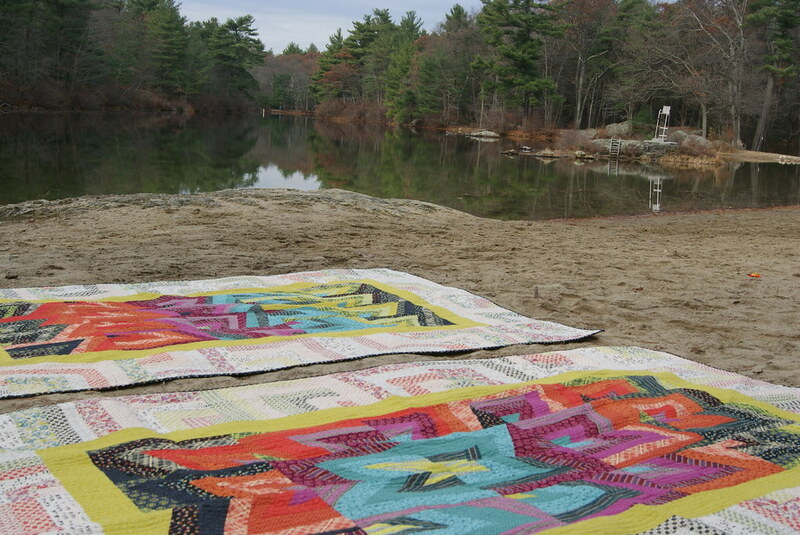 These two quilts are just gorgeous! Love the saturated centers surrounded by the softening tones of the edges. Congratulations on TWO superior finishes! Thanks, Mari! When I look back at the quilts I was making at the beginning of the year I am so surprised I pulled this off. I’m hoping to take on more quilting challenges very soon! This was a great post. Thanks for always being so honest and open about your quilting! It is refreshing to read 🙂 They are absolutely G.O.R.G.E.O.U.S!! I love how they are similar yet different! Wow. Just WOW. Love them to bits, pure awesomeness! Thank you for sharing your creative process and thoughts – I definitely can relate. It’s wonderful that they were such a fabulous learning process for you. Congratulations on pushing through your fears. Good post. Those are beautiful Laura! And that is so great that you didn’t listen to those voices and just went for it! They certainly look creative and original to me. Oi! Put those doubt demons away and trust your instincts. It worked this time and it will work every time. These are so beautiful! We all have that voice in our head, but see what happens when you push past it! I also have the horro of running out of fabric so always buy more than I think I need, which usually means I end up with a much bigger quilt than I thought, and a lot of left overs 🙂 but really, we can always find fabric if we need to. I should buy less and trust myself more. But when you’re not working off a pattern it raises the fabric fear. Good work!! And I know these will be well loved. These are so dynamic, both with the colors and the diagonal lines; beautiful work, truly!! And of course you know I understand those evil voices and the muck they play in your head, so I am so happy you got past them, and look what you have to show for it on the other side. :O Take that, evil voices! Gorgeous! 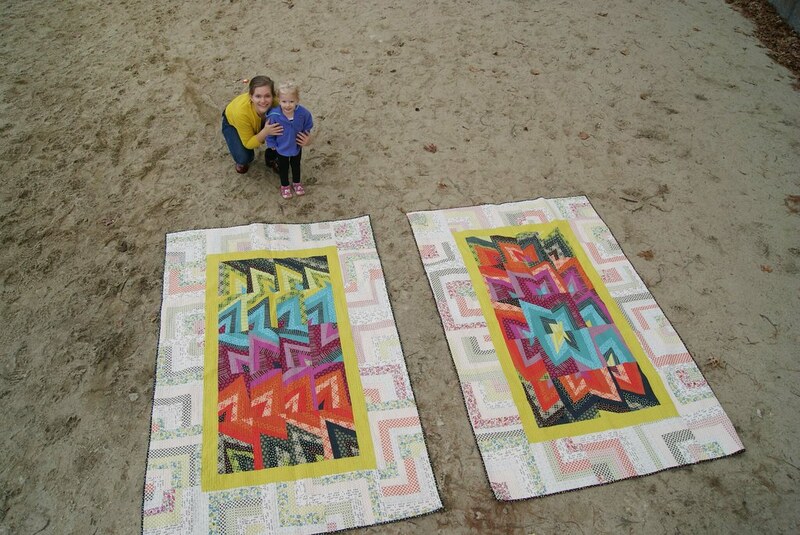 I am so happy that you finally used that bundle to make these amazing quilts! They turned out lovely! I love how you were able to photograph them too. Trust yourself lady! They turned out beautifully! Congrats on a fabulous finish. This begs the question: what’s next? Laura, you did it! Quite the accomplishment. I like the straight-line quilting and the way they are similar (obviously a pair) yet different. so so so good. I love the pictures. It makes me want to do low volume borders on everything. Wow – what a fabulous effort. They look absolutely superb. These are fantastic!! I love the contrast between the LV and the brights! I’m a big fan of improv and working without a pattern (though I do use one from time to time…) and trusting your own creative spirit. Great result, really superb! They are really cool! They will be cherished by the recipients, I am sure. I bet you’ll love them more after taking some time away from them! I know I always do. Especially when there are 2 involved, that is an awful lot of time staring at the same thing. Really beautiful. Great finishes. Now celebrate! You deserve the accolades. These are SO gorgeous. I’m sure they will be well loved by the recipients. I think it’s definitely a good thing to push yourself creatively, but I’m guessing it will also feel good to take a break and work with a pattern again. 🙂 I also love your photos of these. 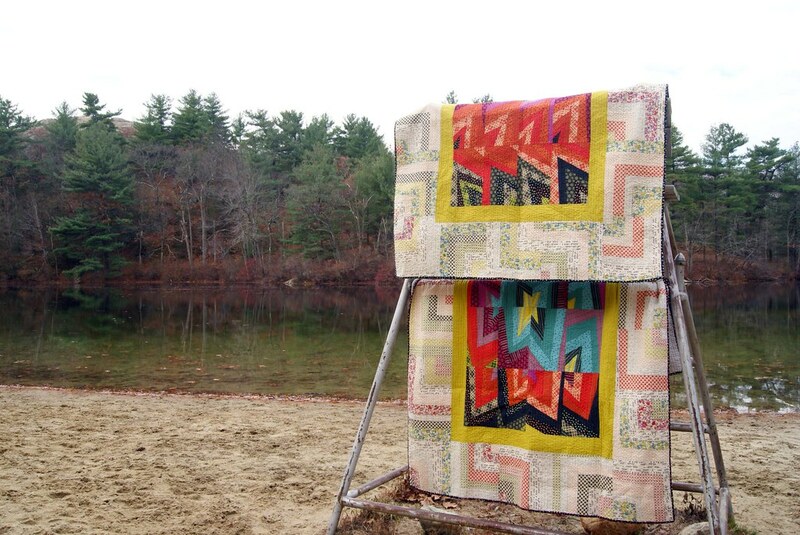 Getting a good shot of 1 quilt is hard enough! Amazing quilts. So beautiful. So colourful. I think they’re great and colorful and energetic. I especially like the explosion of color one. Wonderfuly, wonderful sentiments. It has been quite a journey. The quilts that teach you about yourself are definitely the most valuable. 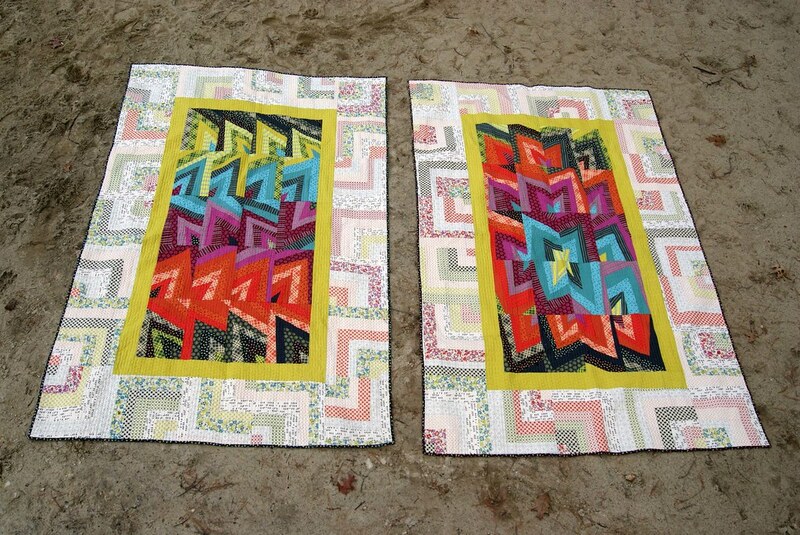 These are two great and unique quilts. You should be proud of course!